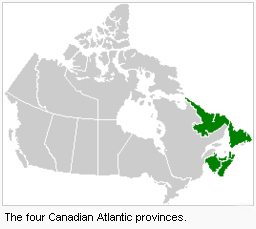 Atlantic Provinces (also known as Atlantic Canada) are the four eastern provinces of Canada: Newfoundland, Prince Edward Island, Nova Scotia and New Brunswick, which borders on Maine and Quebec. The term Maritime Provinces does not normally include Newfoundland. New Brunswick and Nova Scotia became part of the Dominion of Canada in the Confederation of 1867. Prince Edward Island joined Canada in 1873, and Newfoundland in 1949. The Atlantic Provinces are noted for their deep-sea fisheries, good farming areas, and exceptional tourist attractions. The combined population (estimated) in 1997 was 2,410,700 (population according to 1996 census: 2,333,764). Mennonites first came to the Atlantic Provinces in 1954, when Harvey Taves brought Mennonite Central Committee (MCC) Voluntary Service workers to Newfoundland as teachers and nurses. In the same year Siegfried and Margaret Janzen brought their family to Nova Scotia. In 1998 there were five Mennonite churches. Four were related to the Mennonite Brethren (Lower Sackville and Dartmouth, Nova Scotia, and Moncton and Campbellton, New Brunswick), and one, at Petitcodiac, New Brunswick, was related to the Mennonite Conference of Eastern Canada (part of the Western Ontario Mennonite Conference [MC] until integration in 1988). In the 1980s two colonies of conservative Mennonites planted themselves in Nova Scotia. More then 30 families of the Kleine Gemeinde from Belize settled at Northfield (25 miles or 42 kilometres from Truro). Several families of the Church of God in Christ, Mennonite, purchased farms near Tatamagouche. Other Mennonite institutions are in place also. MCC (Canada) supported MCC services in the Maritimes beginning in 1982. At the same time MCC renewed an earlier mandate to serve needy areas in Newfoundland and Labrador. Mennonites in the Atlantic Provinces (MAP) was launched by Dr. Peter Penner in 1975 in order to provide an informal association for an annual retreat designed for fellowship and inspiration around a common Anabaptist and Mennonite heritage. Canadian Conference of Mennonite Brethren Churches Yearbook (1996): 198. Mennonite Reporter 4 (8 July 1974), (22 July 1974), (5 August 1974); 5 (3 March 1975). Penner, Peter. "Atlantic Provinces (Canada)." Global Anabaptist Mennonite Encyclopedia Online. December 2016. Web. 23 Apr 2019. http://gameo.org/index.php?title=Atlantic_Provinces_(Canada)&oldid=141949. Penner, Peter. (December 2016). Atlantic Provinces (Canada). Global Anabaptist Mennonite Encyclopedia Online. Retrieved 23 April 2019, from http://gameo.org/index.php?title=Atlantic_Provinces_(Canada)&oldid=141949. Adapted by permission of Herald Press, Harrisonburg, Virginia, from Mennonite Encyclopedia, Vol. 5, p. 43. All rights reserved.